Are grain-free dog foods good or bad for your dog? I’ve been getting calls, emails, social media messages, and countless forwarded articles from other websites and publications – perhaps even from you! And the first thing I want to tell you is to take a breath! The FDA recently issued a warning (linked here) that it is investigating a possible link between diet and dilated cardiomyopathy (DCM) in dogs. The warning spread like wildfire through social media channels, but unfortunately, it also rapidly got dumbed down to a ridiculous level; it quickly evolved into something like “grain-free foods cause canine heart disease,” or worse yet, “boutique foods might kill your dog. The FDA characterizes the issue as a “potential association” between diets with very specific attributes (and certainly not ALL grain-free diets) and canine DCM – not a cause. 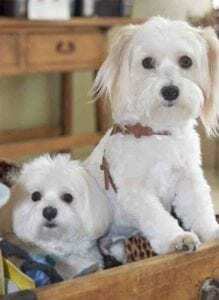 Remy & Louie send wags and kisses! Please note that the FDA’s headline did not say anything about “grain-free diets” causing heart problems – though almost all the blog posts and articles in other publications have been saying exactly that. If you read the FDA’s statement, you will see that they said there may be a link between some grain-free diets and canine DCM, but there are also many other things going on that may be responsible for an observed rise in cases of canine DCM. Linda Case, long-time animal nutrition expert and author of Dog Food Logic, has written an in-depth article for WDJ’s September issue that goes into lots of detail about what is known about the dietary causes of DCM, including several issues regarding taurine and the amino acids (cysteine and methionine) that dogs use to produce taurine. Please revisit wholedogjournal.com in a couple of weeks to see her article about the connections between diet and DCM in dogs. Hint: It’s not as simple as the possibility that the diets are lacking the amino acid precursors to taurine. But for now, hopefully to put your mind at ease, I’m going to briefly discuss some of the pertinent facts that make the story a little more complicated than the “grain-free diets cause heart disease” headlines. The FDA received a report from Cardiac Care for Pets, a practice that employs 19 veterinary cardiologists in Maryland, Kentucky, Virginia, and Texas, that they had seen a spike in canine DCM cases – and not just in the breeds that have a genetic predisposition to developing DCM, but also in breeds that are not known for an inherited propensity for the condition. Their report also included the fact that all of the cases had something in common: all the dogs had been eating diets heavy in peas, lentils, chickpeas, and potatoes. What is a “main ingredient”? There isn’t a legal definition, but in our book, it’s anything in about the first five ingredients on the list. As you probably know, food ingredients are listed on labels (by law) in order of their weight in the formula before the food is cooked. The first four to six ingredients generally represent the majority of what is in the food. That said, the FDA’s warning also addressed “multiple legumes.” Our readers should be alert to the fact that food manufacturers sometimes list smaller amounts of several similar ingredients, or several constituent parts or “fractions” of the same ingredient. This not only visually minimizes the seeming presence of those ingredients in the food, but also makes the total of the ingredients ahead of these fractions seem to be present in more significant amounts than they actually are. For example, it would appear that a food that lists its ingredients as “Chicken, peas, pea protein, pea fiber…” contains more chicken than any other single ingredient. But if you added up the total amount of pea-based ingredients, they would surely outweigh the chicken. This is what the FDA is getting to with its warning about “multiple legumes” – foods in which the legumes, taken together, might outweigh the animal protein sources. No matter what your dog eats, if she has any signs of DCM – including decreased energy, cough, difficulty breathing, and episodes of collapse – you should make an appointment to see your veterinarian ASAP, preferably one who can refer you to a veterinary cardiologist. If you feed your dog a food that contains any potatoes, peas, lentils, or other seeds of legumes (such as chickpeas/garbanzo beans, soybeans, other types of beans, and alfalfa seeds), look at the ingredients list. If the food contains one or more of these ingredients high up on the ingredients list, has several of these ingredients, and/or is a limited-ingredient diet – typically, one containing only one animal protein source and one or two carbohydrate sources – the possibility is good that the food is one of the type that is being looked at as possibly causing a higher incidence of DCM. In contrast, foods that are not limited-ingredient foods and contain just one of those ingredients, or that have one or two of these ingredients fairly low on the ingredients list (say, as the fifth or sixth or lower-level ingredient/s on the list), are not the kind of diet that has been connected with DCM. – Are you feeding your dog this food because it’s the only diet you have been able to find that does not trigger other health problems in that dog? If so, continue feeding the diet, but carefully monitor your dog for any hint of signs of DCM. Also, discuss possible alternative diets and/or a blood test for taurine levels, with your veterinarian. – Are you feeding your dog this food because you like the company, or it was recommended to you, or for no particular reason? Then consider switching to a diet that either contains fewer or none of these ingredients, and read on for more recommendations. Please understand that there are grain-free diets that do not contain potatoes, peas, lentils, or other seeds of legumes as main ingredients. For example, there are many raw diets, fresh-cooked/frozen diets, canned diets, and even some dry/kibble diets that are grain-free that do not contain potatoes, peas, lentils or other seeds of legumes. Not all grain-free diets have been implicated as concerning as regards canine DCM. But, as we have been saying for some time (most recently here), grain-free diets have gotten inordinately popular for no particular reason. Many dog owners buy these products because they have heard some vague argument that “grains are bad for dogs” – an ill-informed blanket generalization we have fought against for ages. There is no particular advantage – and actually, several disadvantages – to feeding a grain-free diet (of any kind) to a dog who doesn’t have any problems with eating and digesting grain. Grain-free diets are often far higher in fat and calories than many dogs require. In dogs who gain weight easily, there is a very real danger of having to reduce the amount of food that one feeds the dog so much (in order to keep him from gaining too much weight), that he is at risk to become malnourished. In other words, if you cut his portion of a super-high-calorie diet to a reasonable number of calories, he may not get enough of the vitamins and minerals he needs. Commercial diets that contain grains have been around longer and have been more thoroughly tested (in clinical settings and through common use) for far longer than diets that use increasingly novel non-grain sources of carbohydrates. As Linda Case explains further in her article in the September 2018 issue, certain types of diets (specifically, diets that contain lamb meal and rice diets, soybean-based diets, diets high in rice bran or beet pulp, and high-fiber diets heavy in soybeans), have been previously identified as possible dietary causes of low taurine levels in dogs – something that is known to contribute to the development of DCM. However, we would not want to be on the record as saying “all grain-free foods are bad.” That’s another ridiculous overstatement. There are some terrific grain-free foods on the market – and some dogs do far better on these products than any grain-containing foods they have been fed. Owners have to look for products that work well for their individual dogs – and be willing to change as their dogs’ needs change. This same expert has also implicated foods that contain “exotic ingredients,” which she provided a partial list for in one article: “kangaroo, lentils, duck, pea, fava bean, buffalo, tapioca, salmon, lamb, barley, bison, venison, and chickpeas.” Hmm. All in all, we have lost track of the number of times she has been quoted as saying that pet owners should avoid “boutique, grain-free, or exotic ingredient diets” – and, unfortunately, this over-broad and ill-defined description is finding its way into more and more discussions of this concerning issue. We have one more bone to pick with this expert; one of her articles on this topic suggests that dog owners do themselves a favor and “stop reading the ingredient list!” This makes us absolutely see red, as it harkens back to the “bad old days” of pet food. Twenty years ago, the making of pet food was a black box. “You guys, we are the experts here, trust us!” was the message of Big Pet Food. Consumers could no more find out where a food was made or where its ingredients were sourced than find out where the company CEOs ate breakfast. A suggestion that consumers shouldn’t worry their pretty little heads about what is actually in the food they buy for their dogs, and which is listed on the label by law for the protection of consumers and their dogs, is downright insulting.